The body of the crashed Lion Air flight is believed to have been found by searchers, according to Indonesia's military chief. The flight took off from Jakarta airport and was carrying 189 people when it crashed into the ocean just minutes after taking off. Indonesia's President Joko Widodo personally visited a rescue site where debris from the crash is being processed. 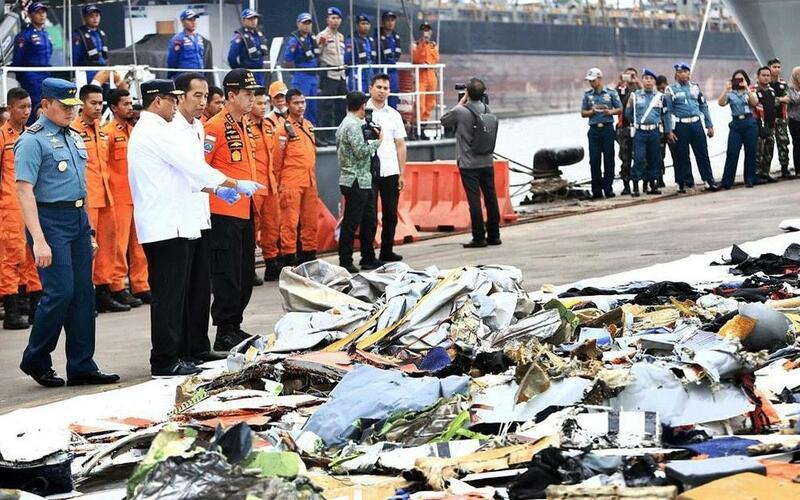 Indonesia's military chief Hadi Tjahjanto said a search and rescue team had found what appeared to be "a part of the fuselage of JT610." Tjahjanto also said that the search team had the location coordinates of the wreckage but was still in the process of confirming the fuselage did indeed belong to the crashed Lion Air flight JT610. The flight was carrying 189 people including crew and two pilots and was scheduled to arrive at its destination in Pangkal Pinang in around an hours time. But Lion Air flight JT610 never arrived at Pangkal Pinang leaving grieving family members to mourn at the airport. Transport safety officials reported that the search and rescue team had heard a ping sound late on Tuesday and divers are preparing to ascend to the crashed plane Wednesday morning. The fuselage that searchers have located is 32 meters below the waves. An animation showing the flight's radar path is a clear indicator that something went drastically wrong. It is not clear if the crash was intentional or if it was due to a mechanical failure. The altitude of the flight took a sudden dive just before it was no longer detected on radar. Searchers have located a 22-meter long object they believe to be the fuselage of flight JT610 and the next step will be to send divers to the wreckage. Rescue officials have been searching for any voice or data recorders in an attempt to understand what happened to Lion Air's brand new Boeing 737 MAX 8 jet. The Boeing 373 MAX 8 is the larger than its predecessor and was first put into service by Lion Air in 2016. Indonesian divers are using "pinger locators" to hone in on the exact location of the cockpit recorders in hopes of recovering the invaluable black boxes. Witnesses on nearby boats say around 60 divers in inflatable boats along with 35 vessels are aiding in the search. Many debris including passengers' personal belongings has been located. Officials from Indonesia's transportation authority say there are no plans to ground the other Boeing 737 MAX 8s in the airline's fleet. Lion Air has been one of the country's fastest-growing airlines and serves dozens of domestic and international destinations. My bet is on a Muslim Radical being involved. From what digging I’ve done, it sounds like flaky instrumentation and a “I think it’s better now” repair the day prior. But it could be mudslime terror, just from a different angle.